2-day climb of Mt. Ruth was awesome. Picture shows the slope below the bluff from where we camped. Access to the TH is clear. The trail to Hannegan Pass was mostly clear of snow until the upper part of the switchbacks just below the pass. Before that though, there was one snow bridge crossing of a stream. We used a hand line and skirted above it on the way in. On the way out, there were enough footprints going across to give us confidence it was OK. How much longer the snow bridge will last is questionable. 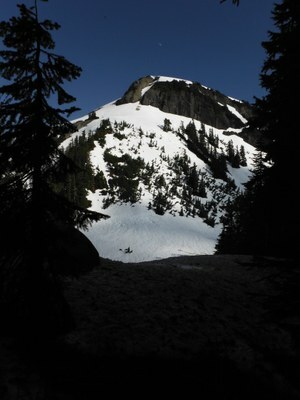 From Hannegan Pass, the route was on snow and less than a 100' of the muddy trail up the slope below the bluff was visible. Above that section, all was snow. Our party of 9 left the TH about 10 AM and reached our camp area at 3 PM. Lots of water available along the way so don't overload at the TH. We had planned to camp close to the base of Ruth Peak but decided to camp just to the south of Hannegan Pass. The last of the running water was available about 150 yds down the trail from the pass. The only other running water beyond the pass was in the short, open section of the muddy trail going up to the bluff. Two other parties had made the same decision on where to camp. Another party camped where we had planned, and there was a party of 4 camped on top of Ruth. There is still a lot of snow so no open crevasses. We departed for Ruth about 6 AM and returned to camp around noon. We were back to the TH at 4 PM. Weather was warm the entire time. I used a light vest and never did use my light puffy although the others used their puffys. Most of us used 32 degree sleeping bags. A very light tent worked well. We took but did not use crampons. We plunge stepped coming back down the slope below the bluff and the snow was good for doing so. A ruffed grouse kept the group company at camp sending out romance calls until 9:30 PM and started back up at 4:30 AM. Round trip mileage for doing Ruth was about 12 miles.